If you take a good look at your collection of necklaces and bracelets, you'll notice that there are many styles of jewelry clasps. Each type of closure has its advantages and disadvantages. 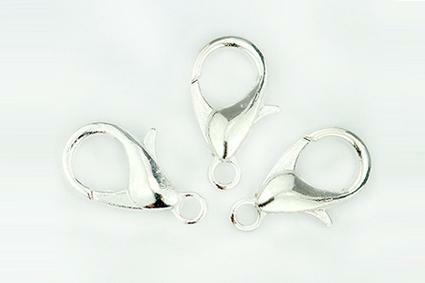 Also known as "trigger" clasps, lobster clasps are some of the most common options for closing necklaces and chains. These closures are typically ovals, but they can be other shapes as well. To operate the clasp, you pull back a tiny metal trigger. The trigger opens the clasp, allowing you to attach the other end of the chain or necklace. You'll find these on fine jewelry as well as on handmade items. Lobster clasps come in different sizes and materials to accommodate various weights and types of jewelry. Lobster clasps are very strong since the ovoid shape means that the strain is never on the delicate part that opens. The only disadvantage to this style of closure is that it can be difficult to operate with one hand. Similar to a lobster clasps, a spring ring closure uses a tiny trigger. However, these clasps are always circular. They consist of a hollow open circle with an inner piece that retracts when you pull the trigger. This provides an opening for the other end of the necklace or chain. They come in a wide variety of metals and sizes, and some are embellished with engraving, two-tone decorations, and even tiny gems. You'll find these clasps on everything from fine jewelry to costume pieces, although they are usually used on items that are more delicate. Because of the circular design and the relatively weak area where the inner portion of the clasp retracts into the hollow circle, spring ring clasps are not as secure as some other options. The inner part has a tendency to break or bend if too much strain is put on the jewelry, making them a poor choice for heavy necklaces or for bracelets that might catch on things. 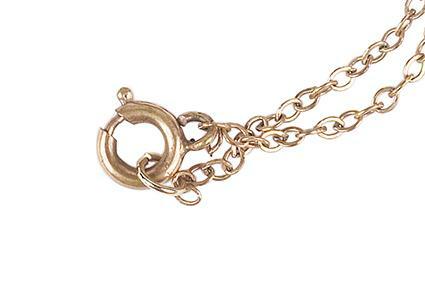 The aptly named safety clasp is a popular option for fine jewelry. This style of closure often includes elaborate filigree work. To operate the clasp, you insert a tiny, flexible hook into the outer portion of the clasp, catching a small bar inside the clasp. Then you slide the entire hook into the outer portion, where it clicks into place. This provides an extra level of security. To open the clasp, you pinch the ends of the hook together and slide it out. Safety clasps come in many sizes and materials, but it's common to find them in gold and sterling silver. This is one of the most secure options for fine jewelry, however it does have a couple of disadvantages. Because of the precision required in making this type of design, it tends to be more expensive than other choices. Additionally, the tiny hook portion is very delicate and can bend with repeated use. This is an ideal choice for valuable, special jewelry you don't wear every day. 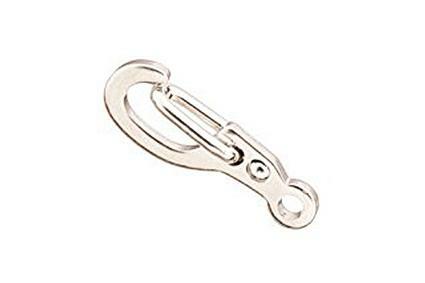 Operating in much the same way as a tiny climbing carabiner, these clasps have a one-way hinged portion. You can open it by pushing against it from the outside with your fingernail or the jump ring on the other end of your necklace or bracelet. This hinged area doesn't open from the inside. These clasps come in various sizes and materials. The main advantage to this design is that you can operate it with one hand. This is ideal for bracelets. However, you don't often find this style of closure on fine jewelry since it isn't especially secure. Pressure from any outside object will open the clasp and risk loss of the jewelry. 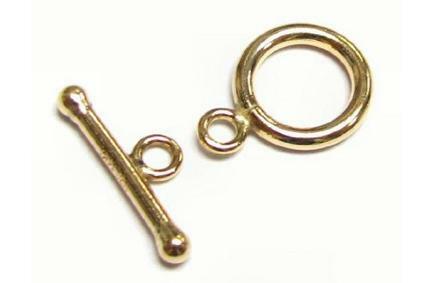 A less common choice, a hinged hook clasp consists of a hook that has a locking hinge right at the point where it curves. By using your fingernail, you can open the hook, insert the other end of your necklace or bracelet, and allow the hook to close again. You'll find these in base metals as well as precious metals like sterling silver. They tend to be longer than a centimeter. 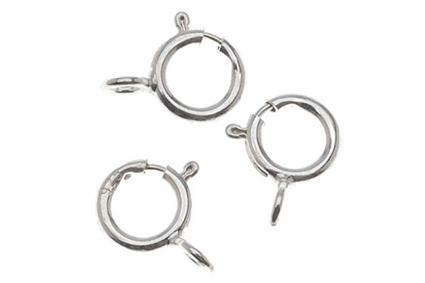 These clasps are perfect for one-handed operation, making them a possibility for bracelets. However, there are some major security issues since anything catching on the hook can cause it to open. Additionally, their relatively large size and precise design means that they are costly options in precious metals. This simple design works just like it sounds: You simply insert the hook on one end of your jewelry into the eye on the other end. The shape of the hook affects the security of this closure; tighter hooks are a bit safer. You'll find these affordable clasps on fashion jewelry and costume pieces, but they are not common on fine jewelry. They come in many different sizes, in base metals and precious metals. One advantage of this design is that you can operate it with one hand. However, any slack in the necklace or bracelet makes this type of clasp less secure. They also have a tendency to catch on things. A box clasp is a precisely engineered option that is ideal for bracelets. It features a wedge-shaped piece of metal that compresses when you slide it into the other portion, or "box," of the clasp. It clicks securely in place. To open the clasp, you simply push a lever that compresses the metal wedge, allowing it to slide out. These come in all different styles, some allowing multiple strands of beads or chains. You'll find them in plain finishes and elaborate filigree and in gold, sterling silver, base metals, and other options. The main advantage of this design is that you can operate it with one hand. Because they require precise fitting of the wedge into the box, these clasps can stop functioning securely if the wedge piece is damaged. Repeated use can wear them out, so they are better for items you don't wear every day. Just as the name implies, magnetic clasps use the power of magnets to keep them closed. They offer an affordable option for fashion jewelry. Each end of the metal clasp features a magnet. When the two ends are placed near each other, the magnets pull them shut. To open the clasp, you slide your fingernail between the two parts. These closures are usually made of base metal and are sometimes plated with precious metals. Ease of use and affordability make this design popular for handmade jewelry or costume pieces. It's important to note though that this is not an especially secure choice. A good tug can break the connection between the magnets, causing you to lose your jewelry. Bar and toggle closures are great for bracelets since you can operate them with one hand. They feature a large ring on one end and a bar on the other. To operate the clasp, you turn the bar sideways and slide it through the ring. Since the bar is slightly longer than the ring's diameter, the clasp says closed. 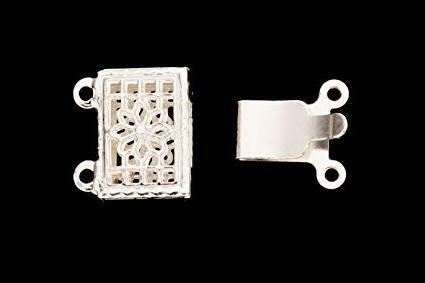 You'll find these in simple and ornate styles and from base metal as well as sterling silver. Besides one-handed operation, the advantage of a bar and toggle closure is its beauty. This is a large clasp that adds a statement to a piece of jewelry. It can even be the focal point of some designs. However, this isn't ideal for every item. The bar can catch on hair when used in necklaces, making it less secure and potentially annoying to the wearer. It also doesn't work well if there's too much slack in the bracelet or necklace as it requires a certain amount of tension to keep it securely closed. This style of clasp features a tube and a bar. The bar slides into the tube to close the jewelry, sometimes locking in place with a magnet. These come in a variety of styles, although they often feature rings for multiple strands of beads. They are affordable and secure, which makes them a popular choice for artisan jewelry. 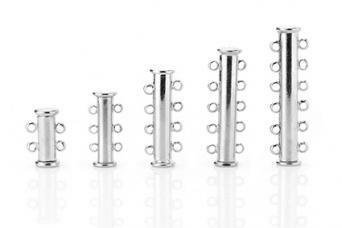 Tube slide clasps don't have many disadvantages, but they can be clunky for delicate jewelry items. They are more common in necklaces since it can be a challenge to operate them with one hand in a bracelet. 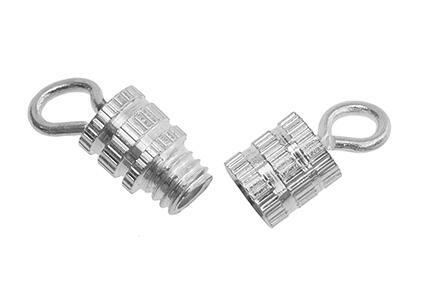 Just as the name implies, screw clasps operate by screwing one side of the clasp into the other side. They are usually barrel-shaped, but they can also be any type of sphere or cylinder. 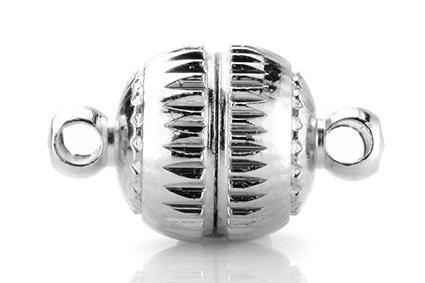 You'll usually find these in base metals, but there are also some options in sterling silver. The primary advantage to screw clasps is their security. Because the clasp is threaded, it doesn't accidentally open. However, it takes a little precision and time to get the clasp closed. When you're reaching behind your neck to do it, that can be annoying. Because these definitely require two hands, they don't work well for bracelets. If you're buying a new piece of jewelry or are designing a necklace or bracelet, it's important to think of all aspects of the clasp when trying to decide on the best option. Be sure to consider the following. Your jewelry item and price point will partially dictate your choices when it comes to metals, but it's important to choose something that will be durable. Base metals are fairly strong, and sterling siler is also a good option. Gold is beautiful for fine jewelry, but it does not have the durability for some applications. If the piece is a necklace, almost any type of clasp is available to you. However, use caution choosing something that may catch on hair or that requires a lot of precision. For bracelets, one-handed operation is very important. Since you are wearing the bracelet on your wrist, you'll only have the other hand to open or close it. Stay away from clasps that require the wearer to find someone to help them put on their jewelry. The price of a clasp varies depending on the style and material. Precision-engineered clasps tend to be more expensive, as do those crafted from precious metals. When selecting a clasp for a piece you really like, buy the very best option you can afford. The clasp is what stands between you and losing your jewelry, so it's worth a little extra investment. The best clasp for your jewelry depends on personal preference, the type of item, your budget, and other factors. Knowing your options can help you find a secure clasp that will keep your jewelry safe for many years to come.